The accounts section of the Ebonyi Government House was on Friday gutted by fire which disrupted activities within the complex. No life was reported lost in the fire which started around 9 a.m.
Dr Kenneth Ugbala, Senior Special Assistant to Gov. 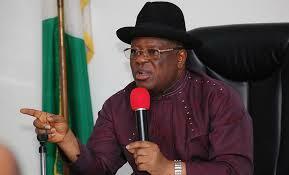 David Umahi on Internal Security, told newsmen that it took the combined efforts of workers and the State Fire Service to put out the fire. “The fire outbreak was caused by a faulty electrical connection within the accounts section and the level of damage was minimal. “An upholstery and cottons within the section were completely burnt and we would ascertain the true extent of damage when the fire service concludes its task,’’ he said. An eye-witness, who spoke under the condition of anonymity, told newsmen that the fire started with a thick fume emanating from the accounts section. “The shouts for help attracted workers who used improvised items such as water and detergent to put out the fire before the arrival of firemen,” she said. Mr James Owoh, the state Chief Fire Officer, said that his officers promptly responded to the distress call from the Government House. “We have always been responsive to distress calls and Government House officials acknowledged that the situation was promptly put under control,” Owoh said.